There’s nothing like getting a good deal, but the deal Morah and I recently got on some blue jar Stilton at our grocery store can only be described as a hyper-value. 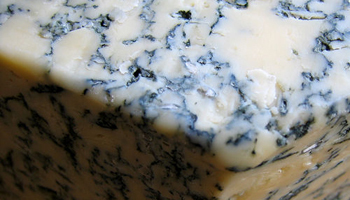 About a month or so ago, we saw the delicious, imported-from-England blue cheese on sale. Normally $30, each crock of cheese was reduced to $14. Stilton is a wonderful cheese, so we bought one. A couple of weeks later, after we had finished off the cheese, the sale was still going on. With no idea how long the price would last, we didn’t want to pass up the chance to enjoy this creamy-yet-crumbly delight at such a value. When we went shopping a few days ago, the Stilton was still on sale, but this time, the price was different. I saw two numbers on the sale tag: $5 and $25. I immediately thought, “Aha! We really scored because now the cheese is only $5 off instead of $14 off.” I was pleasantly smug, and pointed out our great buys to Morah. She just stood there, staring at the price tag. What? That couldn’t be right. But when I looked at the label, it was clear: “On sale for: 5.00. You save: 25.00” My brain had assumed that no one would sell $30 cheese for $5, so that’s how I interpreted the sign. Seriously? Only $5? After all was said and done, we got $90 worth of cheese for $15. Our total savings for all of our groceries was more than we paid for the groceries themselves. Like I said, we got a deal so good, it can only be described as a hyper-value. Are you planning on sharing any tomorrow?